This spine surgery lecture deals with cervical spine trauma – their epidemiology, pathomechanics and Neurological Deficits. 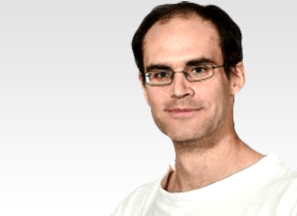 Lecturer: Vladimír Beneš III, MUDr. 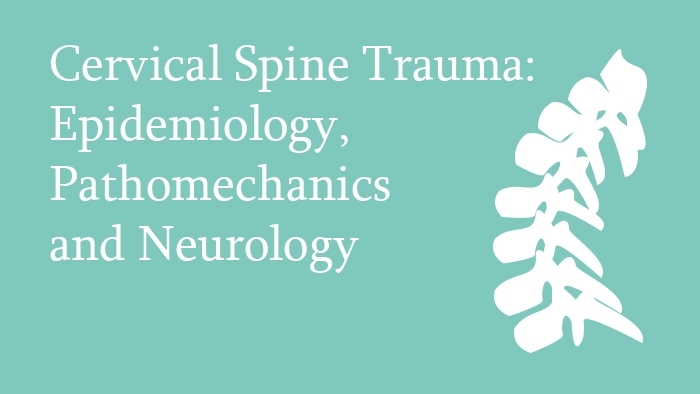 This lecture covers the epidemiology, pathomechanics and neurological deficits which occur in cervical spine trauma, beginning with a discussion of the epidemiology, followed by an explanation of the pathomechanics for axial spine and sub axial cervical spine with the help of force diagrams and imaging studies. Also discussed is the epidemiology of the spectrum of neurological deficit associated with cervical spine trauma, from normal neurology to complete cord transection, in relation to age, gender, type of activity and overall population statistics. Click the 'Enrol Now' button to purchase. We'll send you an Activation Key by email. Log-in to eccelearning.com, and enter your Activation Key to unlock the course. Once unlocked, you can start the course at any time, and in any order. Q: What is an eccElearning Lecture like? A: Each Lecture includes the Lecture Presentation, Additional Learning Resources, Pre-Learning Quiz and Lecture Assessment. Each Spine Surgery Lecture is viewed online in video format and lasts from 20-45 minutes. The Lectures contain relevant additional learning resources (book chapters, research papers, surgical videos, master lecture videos, case reports, review articles, etc. ), which are presented in context and viewable immediately for your convenience. Lecture 5.1 is an invited Master Lecture and does not include the Quiz and Assessment components. Q: How much time will a Lecture take? A: Lecture presentations typically take 20-45 minutes to run. However, candidates are required to review the compulsory and recommended additional learning resources contained within the Lecture. The time taken to view the Lecture and review the additional resources is in the range 3-4 hours per Lecture. Q: What kind of credits do I get from the Lecture? A: Each Spine Surgery Lecture can confer up to 3 Continuing Medical Education (CME) credits, certified by European Accreditation Council for Continuing Medical Education (EACCME). The CME credits are awarded to the candidate on successful completion of the online Lecture. The number awarded depend on the number of additional learning materials available in a Lecture - premium versions of the Diploma and Modules include more material for each lecture, so confer more CME Credits. Q: Can I try a Lecture before I buy it? A: Yes. A free trial Lecture is available for you to review. Just register at www.eccelearning.com and navigate to Your Free Demo Lecture. Details of all other Courses and Lectures are available to browse, so you can be sure of what subjects are covered by each item, but individual products cannot be tried before they are bought. Q: Can I request an extension? A: Extensions are possible in justifiable circumstances. Contact us via our feedback/enquiry form to discuss your case. Q: What is your cancellation and refund policy? A: Candidates may apply for a full or partial refund within 14 days of a purchase. A refund will only be granted if there has been no significant activity on the respective content by the candidate. Applications for refunds may be sent via the contact form. Q: Is there a final exam? A: If you decide to take one of our Advanced Certificates or Spine Surgery Modules then each Module has a multiple-choice Examination which candidates take online. On passing the Examination to finish the Advanced Certificate or Module you will gain accreditation. There is no final exam for the Spine Surgery Diploma, but there is a Surgical Skills Assessment that must be taken to be awarded the Diploma. Q: Is any free trial available? A: Yes, once registration is completed, you can activate our Trial Demo. This trial contains one complete Lecture, including Lecture Presentation and access to all Learning Materials for that Lecture. Access to further Lectures requires enrolment on the Programme, a Module, Knowledge Package, or individual Lecture. Q: Is there a time limit for completing a Lecture? A: Yes, you have a study period of 1 year for a Lecture. A: All major credit and debit cards. Q: What are CME Credits? A: CME stands for Continuing Medical Education. You are awarded CME Credits for undertaking an approved course of medical education. Each Lecture that you complete successfully adds to your CME Credits total. All Lectures provided by eccElearning are accredited by the European Accreditation Council for Continuing Medical Education (EACCME), of the Union Européenne des Médecins Spécialistes (UEMS). You can print out your Certificate of CME Credits after the completion of any Course or Lecture. Q: What do I do if I fail a Lecture Assessment? A: You are permitted to retake a Lecture Assessment up to two times. The Lecture Assessment will be made available to you again 14 days after a failed attempt. If you’ve failed the Lecture Assessment three times, please get in contact with us to discuss your options. Q: What courses does eccElearning provide? 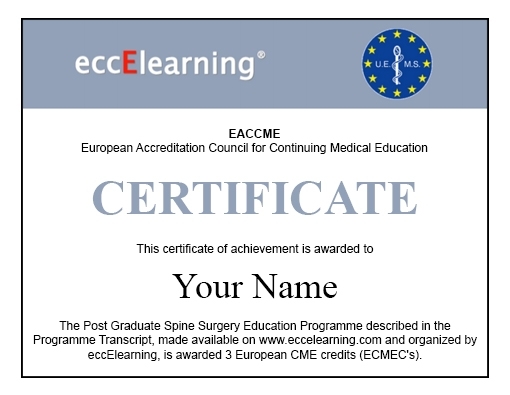 A: eccElearning provides Spine Surgery Courses - all taken from our Spine Surgery Education Programme. We have the Diploma in Spine Surgery with Modules individually purchasable, Spine Surgery Specialist Certificates, Spine Surgery Knowledge Packages, as well as our individually purchasable Spine Surgery Lectures. eccElearning is the world’s first comprehensive, blended online postgraduate education programme in a medical sub-speciality - spine surgery. The course is designed to meet the demands of today's trainee spine surgeon in terms of educational rigour, quality and innovation, as well as current expectations of convenience, flexibility and cost.